The potential of impacted ecosystems for restoration can be evaluated through the analysis of data on regrowth of primary vegetation and duration of restoration periods required by different ecosystems subjected to anthropogenic disruption. The data presented in Table 24.4 show that after certain impacts and under favourable conditions, many ecosystems are capable of relatively rapid restoration. However, if large areas have been impacted, restoration may proceed at a slower rate and with limited success. The monopolization of habitats by superior competitors (often introduced species) is one factor that can affect regrowth. Another problem is that the general depletion of biota can lead to the extinction of rare species. Unfortunately, in Northern Eurasia the share of rare species is the highest in the traditional agricultural regions which are heavily impacted. In the Caucasus, Transcaucasia, and Central Asia, rare species account for 12-25 per cent of all species, and in the steppes of the Ukraine and Southern Russia, in the Transbaikal region and the Far East rare plant species account for 7-12 per cent. They are less important in agricultural areas of central European Russia, which have no more than 5-7 per cent of rare species in their floras, while in the taiga rare plant species constitute less than 2-5 per cent (Environmental and Health Atlas of Russia, 1995). Degradation of ecosystems and the high rates of replacement of primary vegetation by secondary successions is a matter of serious concern. Out of a total of 2.8 million km2 of reindeer pastures, 700 000 km2 are degraded. In the last twenty-five years, the areas in the tundra occupied by lichens (major reindeer forage) have decreased by a factor of 2. Sedges frequently replace the typical moss-shrub communities (Yablokov et al., 1996). A number of negative processes affects the taiga vegetation. 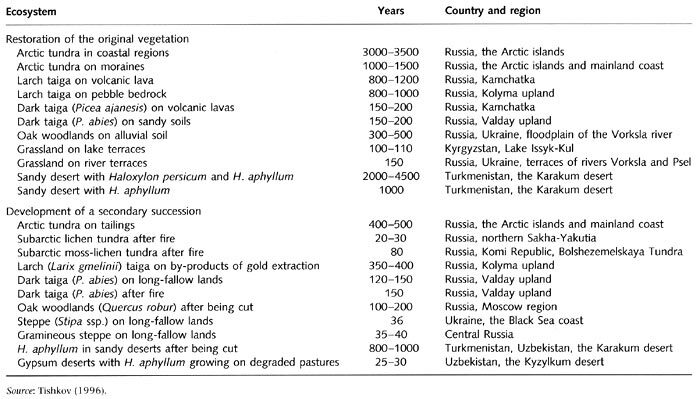 Between 1988 and 1997, areas of annual timber cutting in taiga have been reduced by a factor of 2 (Amirkhanov, 1997). However, in the course of intensive rejuvenation, the structure of forests changes. Typical coniferous species (Picea abies, Picea obovata, Pinus sibirica, P. sylvestris) are replaced by a small-leaved deciduous species such as Betula, Populus tremula, and Alnus incana. Under threat of extinction are xerophilous forests of the Northern Caucasus and the Black Sea coast. Only fragments of the Mediterranean-type xerophilous forests remain in the coastal mountains in the west of the Krasnodar region. These ecosystems are insufficiently represented in protected areas. There has been some success in conservation of forests. Protection of forests in Russia is regulated by the Forest Code of the Russian Federation (1997). According to the Code, there are three categories of forests: (1) those where cutting is prohibited (e.g., riparian forests, forests in zapovedniks and national parks, greenbelts, forests on the southern and northern margins of biomes); (2) forests whose use is restricted, (e.g., in mountainous regions and poorly forested locations); (3) forest for industrial harvesting. Because of the territorial increase of protected areas, in the past few years the share of forests belonging to the first and second categories has increased. Every year, reforestation is carried out on 3000-3500 km2; another 8000-10000 km2 are areas of assisted natural forest restoration.